It’s June! What? How did that happen? My husband and I were just making some summer plans and I realize that summer officially starts in just a few weeks. Though I’d have to say we’ve had such beautiful weather in our area, that you’d think it was summer already. And I am soaking it all in! In that theme of summer and enjoying all it has to offer, I have another sweet little design to show off with this wonderful set from Power Poppy called Wild Mushrooms. 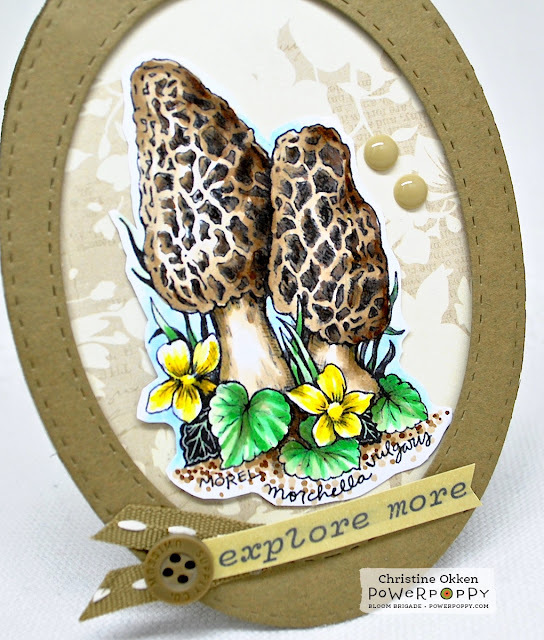 I wanted to go much more rich and earthy with these morels in the colouring with my Copics and a warm earthy feel to the papers. 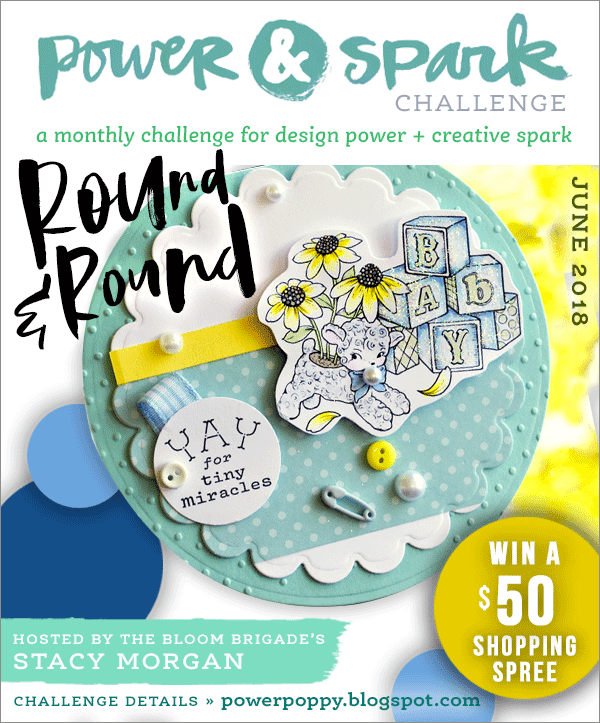 Have you seen the new Power & Spark Challenge hosted by Stacy? 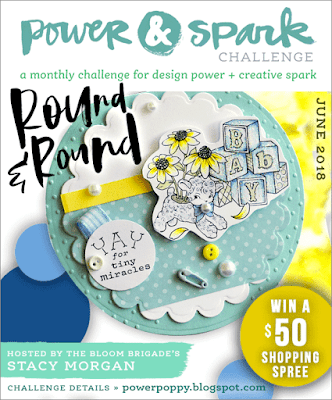 It’s called Round and Round, and it's as easy as rounding your corners or creating a round card. I’ve gone slightly more....oval in my design than round, but you get the idea! I created an oval frame with stitched dies for the design and added some pretty neutral botanical papers behind the image. Aren’t those little mushrooms mixed in with the forest flowers sweet? I like the sentiment too. I love the challenge to explore more! Hopefully you can do that more this summer too! I think it deepens our appreciation of our world, and our own circumstances too. When I’m surrounded by creation in all its wonder, it’s like it sprinkles magical hope and joy over me and I am always deeply impacted for the better. 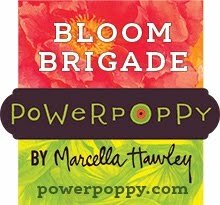 We invite you to the Power & Spark Round and Round Challenge this month, you could win a $50 gift card to the Power Poppy store and these sweet mushrooms and lots of other goodies could be yours! 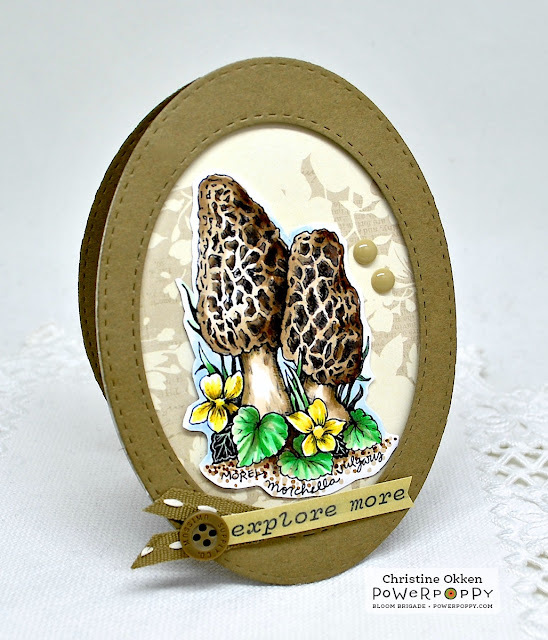 Beautiful card, I love the look of these mushrooms with the little flowers beside them. Its amazing the depth you have achieved with your colouring on them. I agree, summer temps came a little early this year. Your coloring is terrific, they look so real! I do so love the earthy natural look of this with your oval and the designer paper. Those little yellow violets grow in the woods behind our house. I was thinking this morning about it being Saturday, a beautiful morning, and how everyone should get out there and explore the day. Sometimes the littlest things are the most fascinating. Now this rocks... Love the rich warm feeling, fabulous oval shape and makes for a great guy card. LOVE IT!!! They are magical, aren't they?! Beautiful!